Charity Skydive – Make a parachute jump for free! Wanted: People to skydive for free and raise money for good causes! We will send your personalised sponsorship pack complete with sponsor forms for your chosen charity. If you raise at least £500 you can receive a free DVD/Video file of your day! Get your friends, family, and workmates to sponsor your tandem skydive. 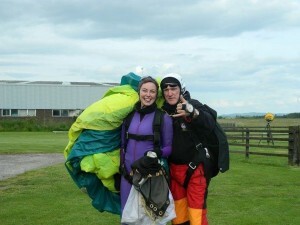 Need further information on charity skydives? – Please read the faq section, if your question is not answered there then email for further info. Please read the FAQ section, if your question is not answered there then email for further info. CONDITIONS Minimum age 16, must have parental consent below 18 years. MAXIMUM WEIGHT: 15 Stone / 95Kg. MAXIMUM AGE: 49 for static line course, 60 for tandem.